The weekend was poopy. Literally. The 3-day potty training was not a success. Watching Violet every second, taking her to do a repetitive potty ritual, sometimes every 1/2 hour, and failing over and over again to catch her “signals”, meant a weekend of a lot of stress, laundry, and disinfectant spray. We are back in diapers. Sometimes you can’t push these things. It’s another rainy day. The kids have been cooped up in the house for four days, but I just don’t have it in me today to take them to the indoor room down at the rec center. We found Violet naked again this morning. She put her diaper in the pail by herself and put her pajamas in the hamper. At least something is going on with her learning to take care of herself, even if it’s kind of odd. We got her dressed, and then she announced that she wanted to wear a costume. So I decided today was monkey day. All the monkey toys out. 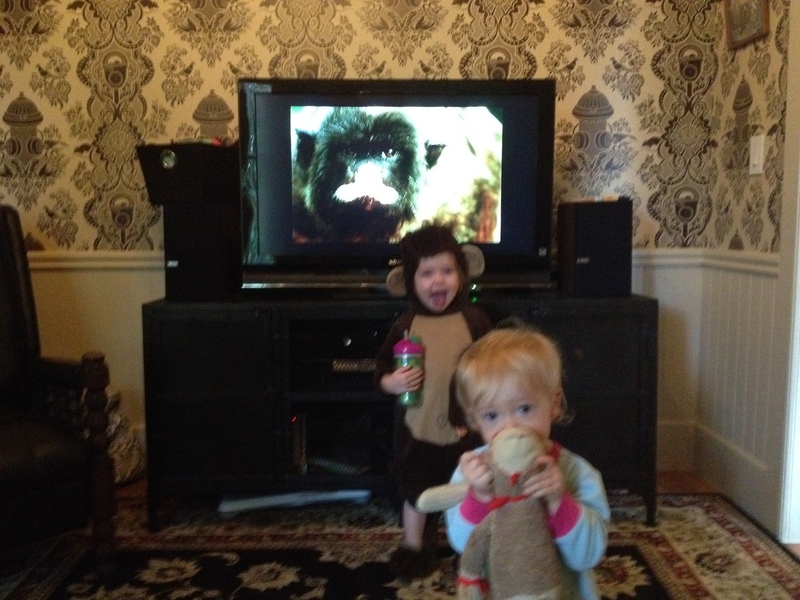 Nature video about monkeys on the dvd player. Except that we’re out of bananas. $500 bucks says just about any monkey would eat a pancake from the batter blaster though. And with the mention of the batter blaster, and staying inside all day, I must share two news items I came across this morning featuring convenience food. The first, from the bizarro-world of Dubai. The Emergency Pizza Button, a fridge magnet that bluetooths with ones phone and sends a message to the local parlor to send up the regular. I confess. There are times when I would push the Emergency Pizza Button. Like when there are no groceries in the house. Monkeys always eat pizza too. Then, incredibly, a news item about a new Silicon Valley start-up dubbed, “The Tacocopter”. Yes, that’s right. The taco restaurant uses the gps in your phone and sends an unmanned drone to deliver tacos directly to your feet. Only problem is the FAA. Once that hurdle is solved, flying tacos on demand. And again, once I was sure that said Tacocopter wouldn’t take out any of our innocent by-standing neighbors, or friendly neighborhood birds, I would totally use Tacocopter, because monkeys also totally enjoy flying tacos. Call me a lazy monkey mom for using convenience foods, and I’ll remind you that I just spent 3 full days following a toddler around, cleaning up her wastes from the floor, while managing to get organic vegetarian meals for her and her monkey sister. Sometimes a monkey mom needs a break. Emergency pizza button and Tacocopter can’t come soon enough in my book. That there is a quadruple monkey sandwich of pure cute. Adorable!!! Monkey days are best! I will have to bring my sock monkey jumper!! You are a wonderful monkey mom! Loved this post!